I wanted to come up with my own creative twist for dinner, considering my meatless adventures, desire to use good quality plant protein and also getting ideas and inspirations from various recipes I’ve looked through. Here’s what I created, and not only is it very tasty, it’s vegan. Here’s what I did to create it. I started by cooking a spaghetti squash, first by poking it a couple good times with a knife to get it ready for steam cooking. The last time I cooked one I had used the oven at 375 degrees and put the punctured squash in a baking dish with about an inch of water and covered with foil. I found another recipe that suggested using the microwave on high for about 10 minutes. I tried that but the outside flesh wasn’t quite softened yet, so I went back to the original idea and put it in a pre-heated oven to finish cooking while I made the sauce. Some recipes I had researched feature diced tomatoes and various spices to make a sauce so I started with this in mind and enhanced with a couple more ideas (thanks to the great things I’ve learned in my Food Fundamentals course and cooking lab I’ve been taking this semester at the university – thanks Chef Guyette)! 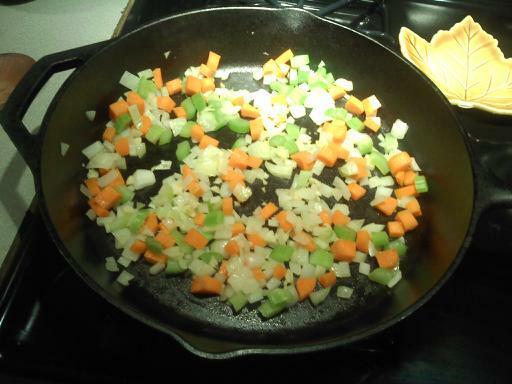 I first started with chopping and dicing a variety of veggies (mise en place – “everything in its place”) and got the cast iron pan heated up. 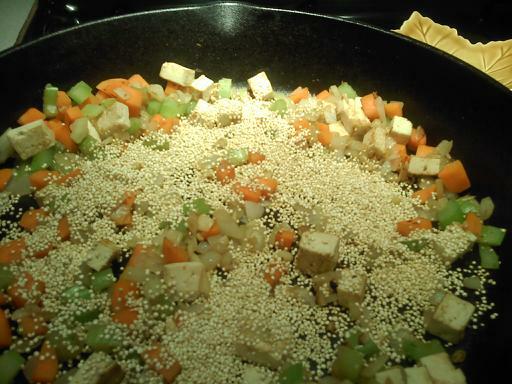 About 1/4 cup dry quinoa seed was tossed in to join in on the browning (toasted quinoa seeds can add a nutty flavor, and quinoa is yet another plant source that contains all the essential amino acids) while the veggies and tofu also continued to take on a browning flavor boost. Once everything was browning up good I was ready to add some liquidy ingredients, starting with diced tomatoes and a bit of water . 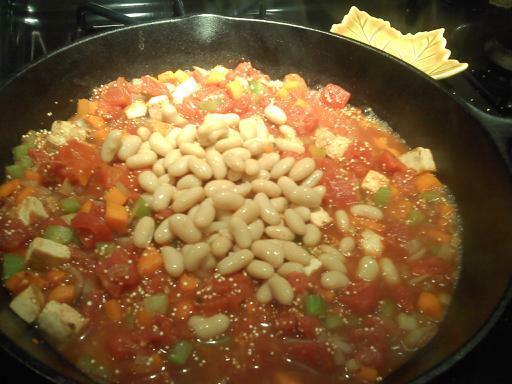 . .
Then some beans (more protein!) and some spices like basil, oregano, sea salt and pepper. 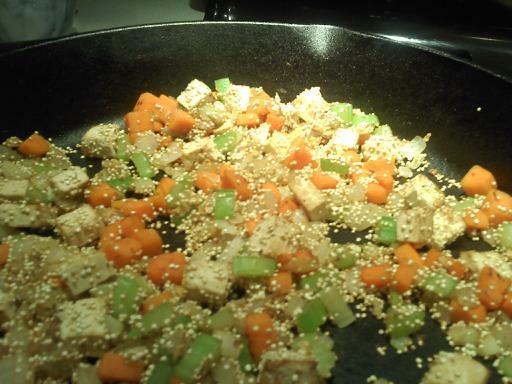 This simmered for about 20 or so minutes to blend flavor and let the quinoa cook. 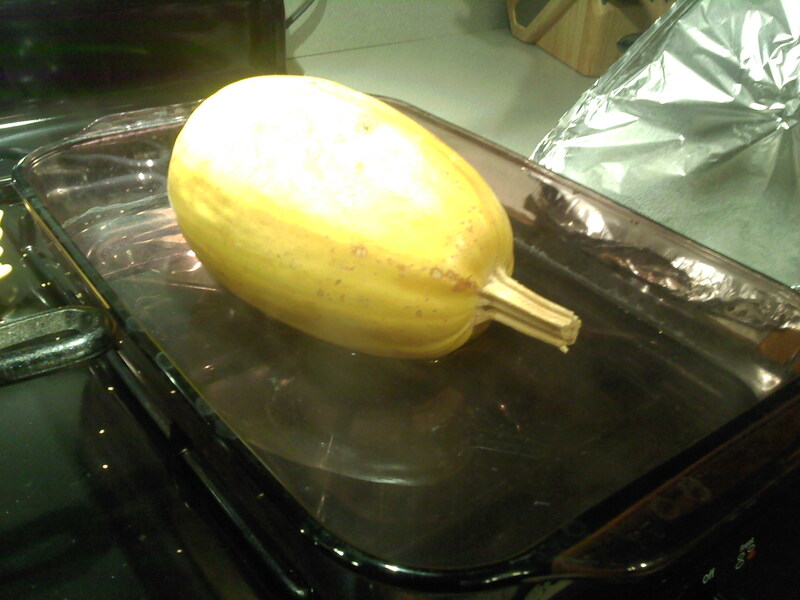 While that was simmering I was able to cut open the spaghetti squash (with an oven mitt – that baby was hot!). Once you gently scrape out the seeds the squash flesh is so easy to scrape out in strands by using a fork. 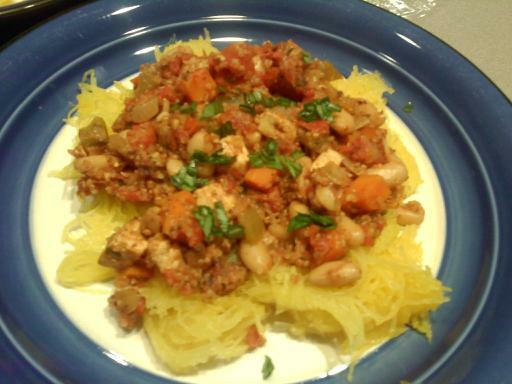 The spaghetti squash looks so much like pasta and is a nice (and nutritious) substitute as well. 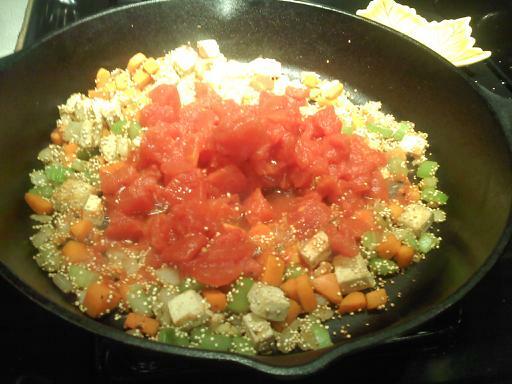 This was plated and then topped with the veggie/quinoa/tofu/bean/tasty sauce and then garnished with fresh chopped basil. It was really tasty and easy to make. Take-away for today: keep exploring, keep trying new culinary creations, tofu isn’t so bad (LOL) and there are ways to eat meatless meals that are protein-rich too. I’m glad I tried – this is a keeper!